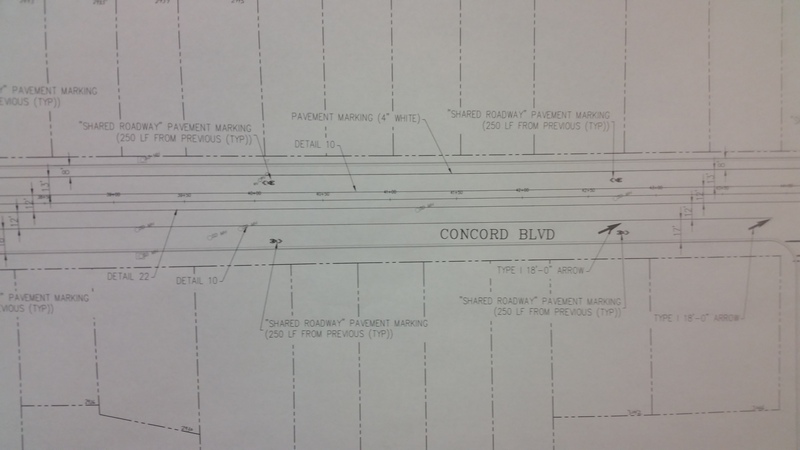 On Wednesday, July 29 the city of Concord held a small community workshop to present draft plans for a Class III Bike route on Concord Boulevard and Class II bike lanes on Arnold Industrial Way. 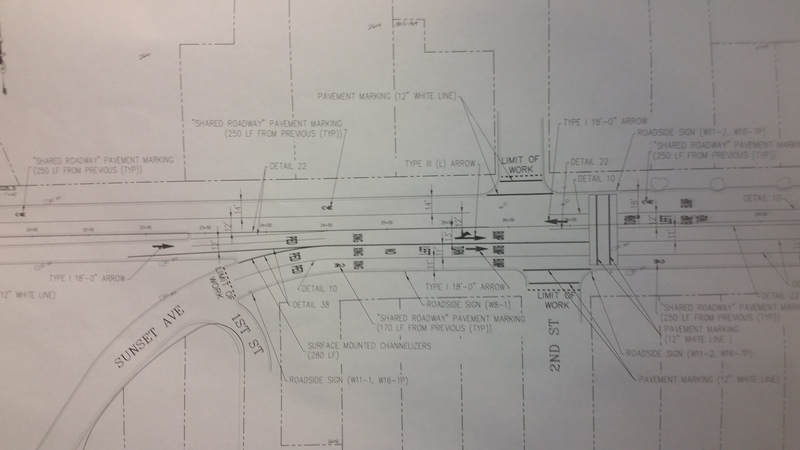 The city’s initial proposal was anchored on the goal of keeping the striping similar to its current configuration. 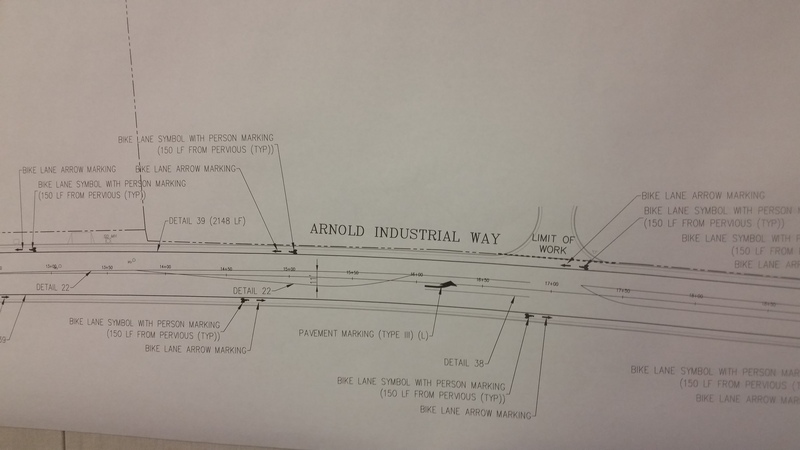 As such, the stretch of Concord Bd would see the simple addition of sharrows, and Arnold Industrial Way would receive 6′ bike lanes, as called for in the Bike Master Plan. However, both of these streets are incredibly wide in sections, and have speed limits of 35MPH. As such we see potential for some NACTO guidelines to be applied and for the city to do much more than the bare minimum in accommodating bicyclists. Sharrows are incompatible and unsafe when applied to a street with a 35mph speed limit. We suggested narrowing the lane widths to encourage calmer traffic by design and asked the consultants to study whether adding a bike lane on one side of the street would be feasible. Crosswalks: The practice of discouraging pedestrian crossings by leaving uncontrolled crossings unmarked is not a valid safety measure (NACTO). Three sided crosswalks are a frustration for pedestrians, making them cross a street three times (more exposure to vehicles) or “jaywalk” which in this case is not illegal but not made safe, either. On Arnold Industrial Way, the traffic lanes are incredibly wide, sometimes 17′ wide even, with an 11′ painted median. Yes, some of this width is to facilitate turning movements for trucks, but there should be some room in there for buffers! The topic of narrowing traffic lanes to increase safety and reduce speeds has been coming up quite a bit recently, and CityLab recently published a good article on why narrow lanes are better. The section of Concord Blvd leading up to Parkside, where cars are merging from multiple different lanes and going very fast around the corner, is a huge issue. We have asked staff and consultants to look at how to make this a safer corridor. One suggestion was to reduce the Sunset Blvd section leading to Concord Blvd to one lane, however were told that such a change might require some additional studies with the air district. There were some very good questions asked last night and really positive conversations. Thank you everyone who came out! Was it Farm Bureau Road or Arnold Industrial Way? Aha.. just a trick, making sure someone is paying attention. You win! I’ll change it now. Thanks!